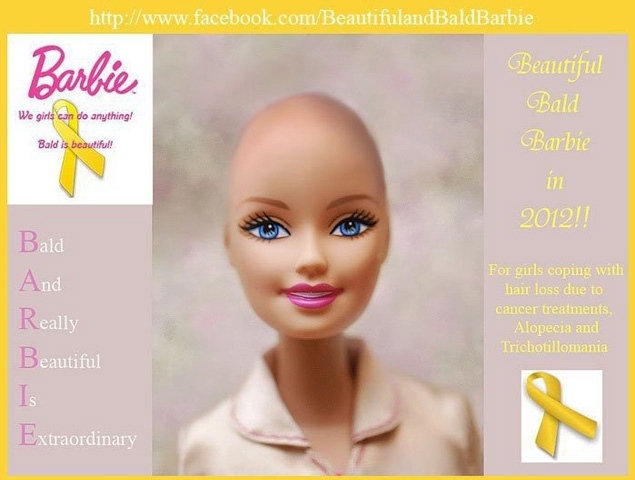 Cancer Barbie Doll : New Bald Doll? Barbie Dolls have been around forever. They have been known to portray a great body image and luscious hair, however, all of that may change soon. Barbie has been an astronaut, an architect, a Nascar driver, and a news anchor. Now there’s a movement by two women whose lives have been touched by cancer to make a Cancer Barbie Doll, one that is bald. They are urging toy giant Mattel to make a Barbie without a ‘do to help kids come to terms with hair loss. Their Facebook page for the “Beautiful and Bald Barbie” campaign had won about 50,000 fans by Thursday — more “likes” than Mattel’s corporate page. What a great idea they have. It seems like they thought of a viral way to display their support for cancer. The only wonder is if Mattel will even respond to the campaign. They have written letters but haven’t heard anything back yet. A Change.org petition has more than 1,000 signatures. And a second Facebook page popped up — with 1,000 fans — pushing G.I. Joe to shave his head for the cause.